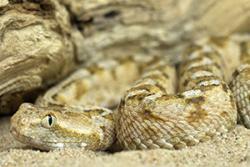 The painted saw-scaled viper (Echis coloratus) one of the species used in the research.New research, which disproves the theory that venom evolved just once in reptiles, could also lead to new medical treatments to counteract snakebite. The “Toxicofera hypothesis”, which proposed that venom evolved and that the majority of reptile species alive today descended from a common venomous ancestor was first put forward nearly a decade ago. At the time this was a radical proposition, as traditionally venom was believed to have multiple origins. Whilst the Toxicofera hypothesis has become widely accepted, it had never actually been tested, until now. Researchers in the School of Biological Sciences at Bangor University used cutting-edge DNA sequencing technology to study gene expression in the venom and salivary glands, as well as several other body tissues from a range of venomous and non-venomous reptiles to test the robustness of the Toxicofera hypothesis. 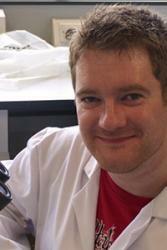 Writing in December issue of the journal Toxicon (doi:10.1016/j.toxicon.2014.10.004), Bangor PhD student Adam Hargreaves and his supervisor Dr. John Mulley, together with colleagues at the Wellcome Trust Sanger Institute and the Institute of Biological, Environmental and Rural Sciences at Aberystwyth University, found that the Toxicofera hypothesis is not supported by these new data, prompting a return to the traditional hypothesis that venom evolved at least twice in reptiles. This has profound implications for how the evolution of venom is understood, and also for the design of new medical treatments to counteract snakebite.